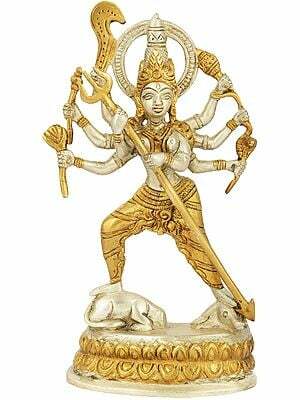 This three feet tall brass statue represents goddess Durga in her ‘ashtabhuja-dhari’ – eight-armed, manifestation. 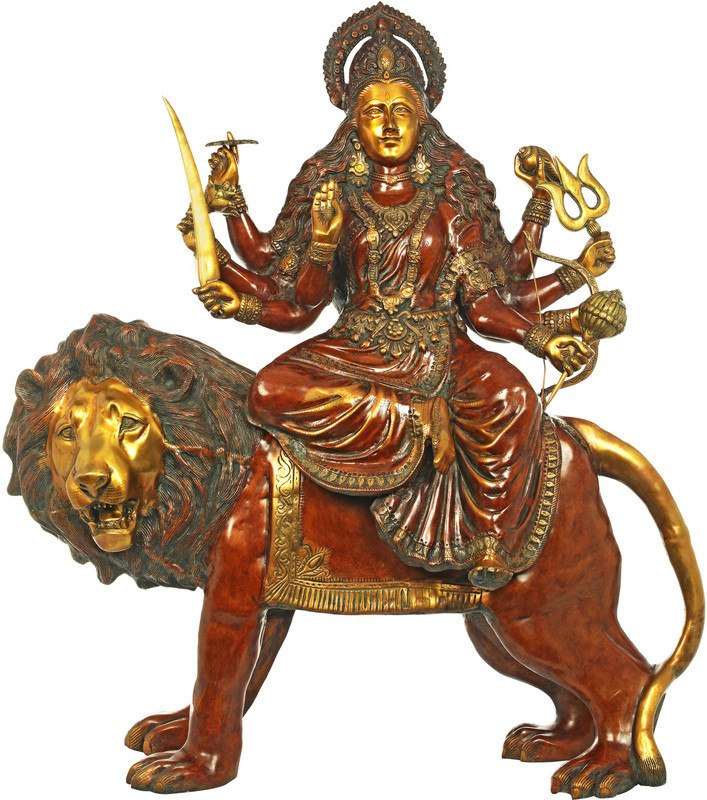 Among all sectarian images, represented in any medium – canvas, metal, wood, stone, clay, textile, or even synthetic, for installing into a sanctum – public or private, or adorning a space in a sitting hall, for an annual calendar or as auspicious icon on a shop’s bill-book or any other commercial document, this eight-armed form of the goddess is the most popular and loved icon. 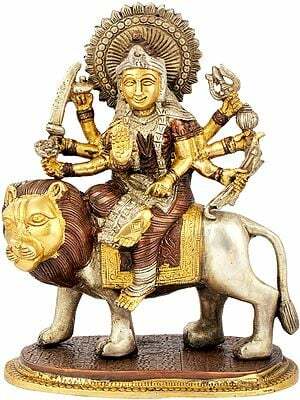 The demon-slaying goddess is Mahishasura-mardini when she eliminates the buffalo demon Mahisha, Chandi, when she kills demons Chanda-Munda, and Durga, the protector of ‘durg’ – fort, that is, the king’s seat, and the subjects’ shelter. 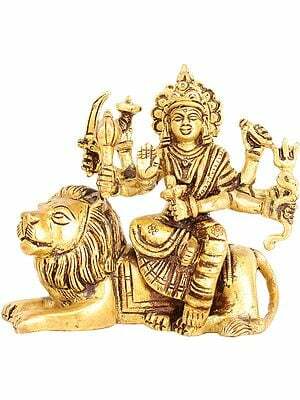 The primordial feminine energy – the prime instrument of Creation, Durga is known and invoked by hundreds of other names. 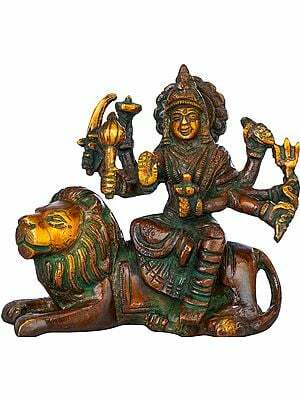 Not riding her mount in the style of a horse-riding figure, portrayed as a rule in profile, and legs, one on either side, the goddess is seated front-facing on lion, as one would, on a couch or seat. 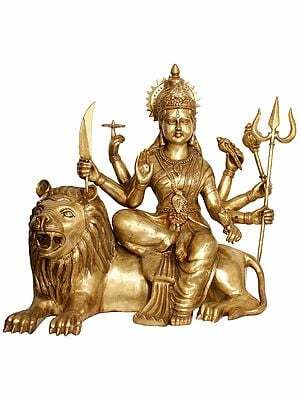 In case of other divinities, and human beings, their seat’s name ‘simhasana’ is a just a formal nomenclature, or defined its lion-like modelled legs; it is only Durga who really sits on a lion. 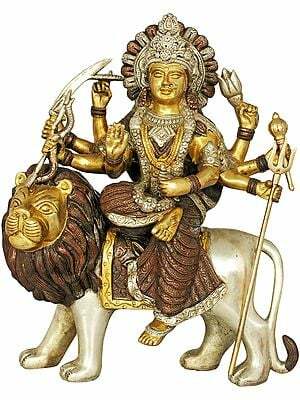 Even the lion has turned to left its face giving its full view – innocent and cute, half opened mouth, tongue, teeth and fangs, well-contained, not ferociously revealing, or a blood-smeared tongue, lolling out, artistically curling mane affording it a beautiful frame. 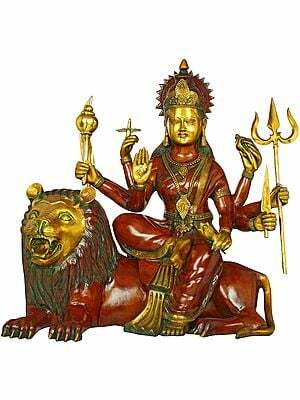 This front-facing iconography is essentially the idiom of divine imagery. 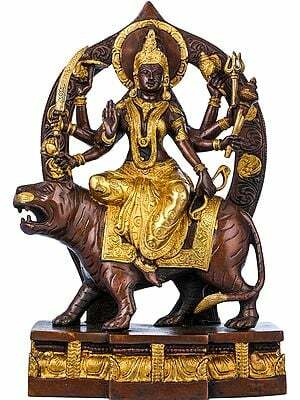 The artist has modelled the tail of the mount like a bow with deep curve obviously for balancing the circular fore-part. 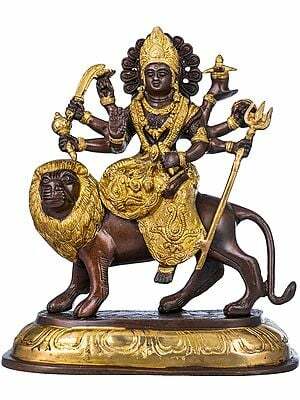 The goddess’s lion that stands for will, determination, energy, and the power of mind, not for generating fear or horror, has in the statue an innocent bearing and childlike cute look. 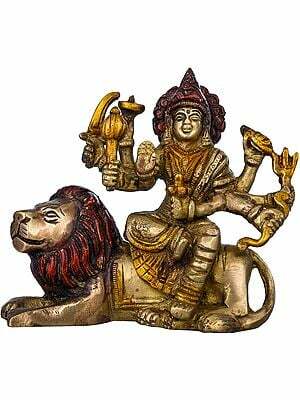 Mythically, lion was the gift from Himvan, the manifest spirit of Himalayas. 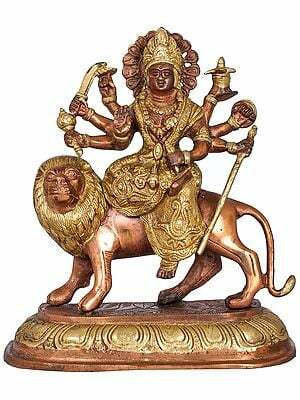 Obviously with its links with Himalayas the Durga’s lion had to be cool and calm by temperament. 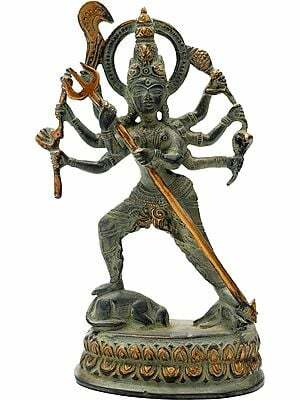 Maybe, the artist hence preferred the effect of silver – the coolest metal, for his statue. 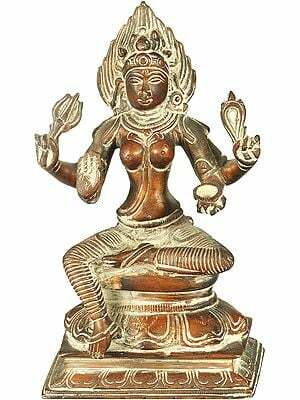 Though deviating a bit from its usual format, with her left leg, not the usual right, suspending down, and the right, folded and laid over the mount’s back, as in ‘yogasana’, the goddess is seated in ‘lalitasana’, literally meaning beauteous sitting mode, one of the postures of sitting as enumerated in classical canonical texts,. 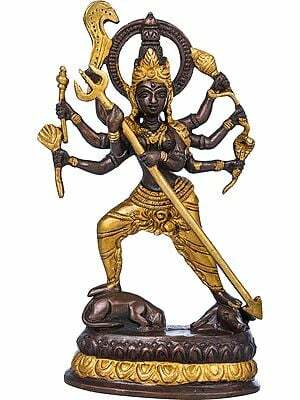 The eight-armed goddess is carrying in her hands on the right side, ‘chakra’ – disc, ‘gada’ – mace, and ‘khadga’ – sword, and on the left, conch, arrow, bow and lotus, whereas the normal right is held in ‘abhaya’ – gesture assuring protection and thus freedom from fear. 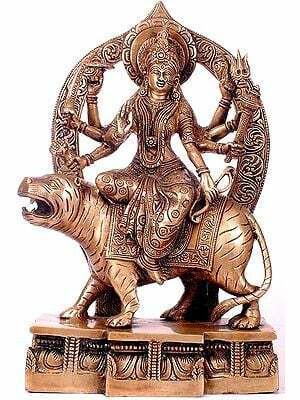 Like entire divine iconography ‘abhaya’ is the essence of the image and all other attributes carried in other hands are its instruments that guarantee it. 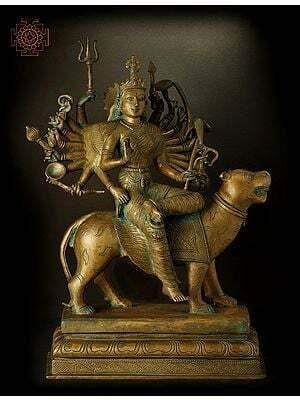 Whatever the reason – ignorance of the related myths, or alike respect for all related traditions, in conceiving his figure of the goddess the artist has blended into her form the Shaivite as well as the Vaishnavite standards as also those of other prevalent traditions, especially as regards the attributes that she is carrying. 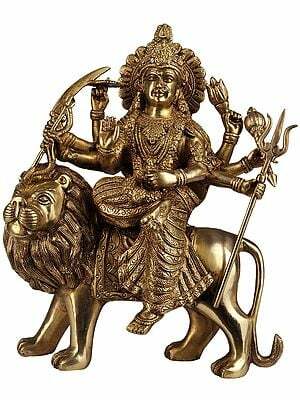 The ‘ashtabhuja-dhari’ Durga is essentially a deity in Shaivite line; however, the majority of the attributes that she is carrying, mainly, disc, mace, conch and lotus, are Vaishnavite. 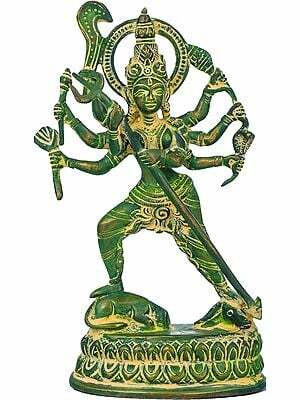 Even her other attributes – sword, bow and arrow, also have Vaishnavite contexts. 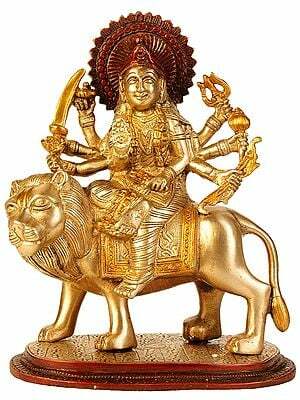 Except her ear-ornament and a garland of skulls, and of course, her mount, alone reveal her Shaivite links. 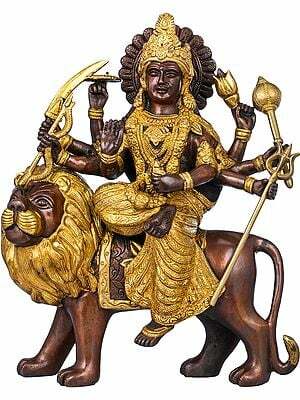 The goddess is in leading role in hundreds of legends relating to her exploits against demons and evil powers and also related to protecting her devotees, this statue portrays just her vision – her divine presence, her divinity pervading the earth and the sky, beyond action, and beyond representing her as engaged in an act against a demonic power. 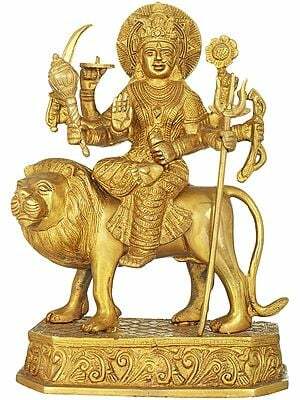 Obviously, not confined to an act or event this image aims at representing her as a divine presence pervading all spaces, commanding all acts, every intellect and every mind, not allowing time to span it. 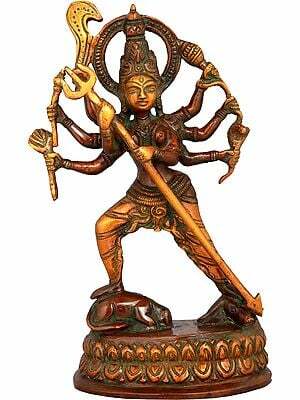 Sublime calm and divine composure coupled with benignity and absolute contentment enshrine the face of the goddess. 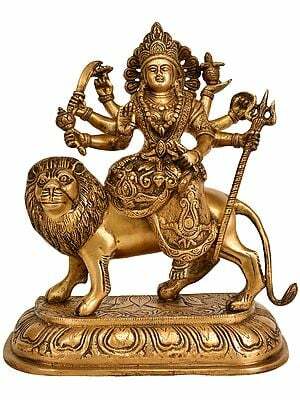 Her perfectly balanced image with a round face and sharp features and clad in a rich but humble looking sari reveals rare grace and elegance. 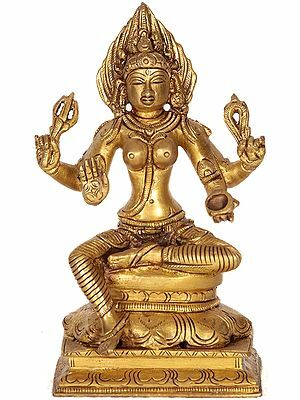 The goddess has been modeled more like an Indian woman rather than a divinity.